It was over 15 years ago that Professor Friedman said "We're more than 50% socialist. And I don't think we're getting our money's worth...is half of your satisfaction coming from what the government does for you?" More recently John Barchilon wrote – "Many...who failed to heed the lessons from...the Founding Fathers are now learning from the Greeks that democracy leads to socialism, which in turn leads to bankruptcy. This is why the Founders went to a lot of trouble to create not a democracy, but a balanced republic." H.L. Mencken used this point to correctly worry that FDR had divided America into "those who work for a living & those who vote for a living." This is the Death Of Democracy that is @ our doorstep. Even with the above pessimistic backdrop I see possibilities for a good start to a technical solution to America's economic problems that can easily be implemented if the American people can change from a "you deserve, you're entitled to" mindset to one of (even limited) personal responsibility – especially for Medicare & Social Security which are on track to overwhelm the federal budget in the not too distant future. These possibilities that I discuss below will contribute to solving the current debt ceiling problem that will most likely come to a head this month. Wisconsin Congressman Paul Ryan has introduced the idea of changing Medicare from being the largest & least efficient buyer of medical services in America to one of distantly resembling a form of personal involvement for its beneficiaries with his "premium support" plan in which the Medicare share as a % of the GDP actually decreases in the decades ahead under "premium support." If today's seniors over 55 will dare great enough to chance that something like the Ryan plan will not affect them & people under 55 will start to adapt to the new system we have a chance to solve the current seemingly intractable Medicare problem that by itself will doom America if nothing is done to correct it. The fix for Social Security is even easier. Currently, the initial Social Security benefit – a person's monthly benefit when they start getting checks - is based on the average real wage growth of their earnings over their working lifetime. Real earnings growth is greater than inflation measures such as the Consumer Price Index (CPI) so in essence the government is guaranteeing a real positive return on Social Security tax withheld for the average person – a guarantee no other investor has. Just reducing this initial benefit so that it is calculated based on the CPI rate solves the Social Security problem – see Susan Lee column in the WSJ dated November 23, 2004 entitled All You Need To Know About Social Security. To specifically combat the debt limit problem Ken Blackwell & others have proposed a "cut, cap, & balance" plan in which federal spending would be controlled so that projected borrowing is cut in half next year (not 10 years from now), spending would be capped @ 18% of GDP (it's 24% now & going higher under BO), & under a balanced-budget amendment the president would be required to submit a balanced budget within the foregoing guidelines that call for super congressional majorities to raise future debt limits or tax rates. Virtually none of the above problems or solutions follows our founding principles – but they do describe the mess we are in. The most effective way (& to take politicians up on their constant claim to make tough decisions) to solve the debt ceiling problem is to decide who we won't pay based on any shortfalls in actual revenue collected versus promises made – the only legal obligation is interest on Treasury securities. Even Social Security benefits are not guaranteed – again see above Susan Lee column for Supreme Court decisions. 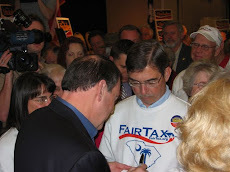 The best way to give the above programs a chance & to change the entitlement mindset is to enact the FairTax which allows people to keep their entire paychecks or pensions free of federal taxes – this point alone re the FairTax will start people realizing the government does not have first claim on their livelihoods. 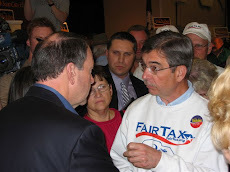 Our best current hope for passing the FairTax lies with presidential candidates Michele Bachmann & Herman Cain. Oh how I miss Mike Huckabee. As the debt ceiling problem is reported in the hostile anti-American media please notice how none of the above programs are included in the discussions – they will be replaced by BO saying he wants to raise taxes on millionaires & billionaires – someone he defines as anyone earning over $200,000 per year. Doug’s proposed measures will also impact a second critical mindset – one belonging to our primary job creators – entrepreneurs, investors, private corporations. Why invest in an extremely business hostile environment? We have to contend with Dodd Frank, ObamaCare, 40% increase in our debt last 2 ½ years, 12% US dollar decline, US support for Brazil oil drilling while disallowing ours in contempt of court, EPA implementation of Cap n Trade, and the most blatant – Government attempt, via NLRB, to mandate how and where our leading exporter (Boeing) can expand. Two specific proposals – “cut, cap, balance” and the Fair Tax, if implemented will quickly change this mindset. The former will shift available resources from the wasteful public sector to the private. The latter’s 0% federal corporate tax will position US immediately as a haven for global venture capitalists, all while being revenue neutral, progressive via prebates to low income. Elimination of IRS and projected $430 billion annual savings to the economy, will also add finally again to a business friendly – I want to invest in the US mindset. Doug’s proposed measures will also impact a second critical mindset – one belonging to our primary job creators – entrepreneurs, investors, & private corporations. Two specific proposals – “cut, cap, & balance” and the FairTax, if implemented, will quickly change this mindset. The former will shift available resources from the wasteful public sector to the private. The latter’s 0% federal corporate tax will position the U.S. immediately as a haven for global venture capitalists, all while being revenue neutral, & progressive via prebates to low income earners. Elimination of IRS and projected $430 billion annual savings to the economy, will also add finally again to a business friendly – I want to invest in the U.S. mindset.